Received May 18, 2018; Revised August 2, 2018; Accepted August 6, 2018. Several bacterial genes have been identified for the successful transformation of model and crop plants to cope with a variety of stressful conditions. Here, we isolated acdS gene from Pseudomonas veronii- KJ and cloned into Escherichia coli (DE3) for the successful expression of recombinant 1-aminocyclopropane-1-carboxylate (ACC) deaminase. Then, Arabidopsis thaliana was transformed to express the bacterial acdS for the production of ACC deaminase and were compared to control plants in their response to water-logging and salt stress conditions. We used strong and constitutive 35S promoter from cauliflower mosaic virus to over-express the acdS gene. The plasmid (PCB302-3) including the acdS gene was transferred into Agrobacterium tumefaciens (GV3101) and the floral dip method was carried out for successful transformation of A. thaliana. We subsequently, measured the growth and development of transformed and control plants. The transgenic A. thaliana expressing acdS gene revealed increased tolerance to water-logging and salt stress conditions and were less prone to the adverse effects compare to wild type plants. Plant growth promoting rhizobacteria (PGPR) that contains acdS gene encodes for 1-aminocyclopropane-1-carboxylate (ACC) deaminase, which is capable of catabolizing substrate ACC into ammonia and α-ketobutyrate (Glick 2014). In response to stress, plants encode for the greater amount of ACC synthase which induce the production of ACC, ultimately the higher amount of ACC is converted into ethylene by ACC oxidase (Barnawal et al. 2014). High concentration of ethylene inside plant tissues is responsible for the stressful condition, causes epinasty, reduces chlorophyll content, promotes aging and leaf abscission, inhibits root elongation, and lowers growth and development (Grichko and Glick 2001a; Glick 2014; Singh et al. 2015). On the other hand, PGPR with ACC deaminase facilitates the conversion of substrate ACC into ammonia and α-ketobutyrate, and mitigates the adverse effects of stressful conditions. Bacteria producing ACC deaminase act as a sink for the exuded ACC, which is the instant precursor of plant ethylene synthesis (Morgan and Drew 1997; Glick et al. 1998; Sergeeva et al. 2006). Recently, several studies have revealed the improvement of stress tolerance in genetically modified plants. The integral expressions of bacterial acdS gene in transgenic plant encode for ACC deaminase and mitigate the detrimental effects of flooding (Grichko and Glick 2001b), metals (Grichko et al. 2000), salt (Sergeeva et al. 2006) and pathogens (Lund et al. 1998) by controlling ethylene synthesis (Klee et al. 1991). The achievements in Arabidopsis genome sequencing have provided opportunities to investigate the molecular basis for the synthesis of stress ethylene. One of the key enzymes in ethylene biosynthesis is ACC synthase, the induction of ACC synthase and function of ACS gene have been systematically examined in the production of ethylene under stress conditions (Peng et al. 2005; Grichko and Glick 2001a). The study of Peng et al. (2005) also suggested the spatial and temporal expression patterns of ACS genes (ACS2, ACS6, ACS7, and ACS9) and proposed two different signaling pathways for the synthesis of ACC synthase under stress conditions in Arabidopsis thaliana. Their results also revealed that one pathway leads to the activation of ACS2, ACS6, and ACS7, whereas the other pathway leads to the activation of ACS9. However, the expression of these genes was highly regulated by the concentration of ethylene present in the plant tissues (Peng et al. 2005). Grichko and Glick (2001b) produced transgenic tomato plants expressing the bacterial acdS gene under the transcriptional control of different promoters (35S, rolD, PRB-1b) and results were compared to wild type plants in their response to water-logging stress. They reported that all of the transgenic tomato plants expressing ACC deaminase increased tolerance to flooding stress, while the plants that expressed an ACC deaminase gene under the control of the rolD promoter showed that ethylene concentration was 30% of the levels compare to wild type plants (Grichko and Glick 2001b). Similarly, Sergeeva et al. (2006) transformed canola plants for the successful expressions of bacterial ACC deaminase, following the growth of control and transformed canola plants in salt stress conditions. Their results also suggested that transgenic canola lines greatly mitigate the harmful effects of salt stress in the presence of ACC deaminase compared to the wild type canola plants, and the improved salt tolerance of the transgenic canola is likely the consequence of the decreased synthesis of stress ethylene (Sergeeva et al. 2006). In plants, the hormone ethylene is the simplest unsaturated hydrocarbon which significantly contribute to the regulation of many metabolic and developmental processes, while also considered as a key component in response to a variety of stresses (Glick et al. 1998; Davies 2010). Ethylene synthesis is affected by different biotic and abiotic factors and the increased amount of ethylene is produced in response to continued stress conditions. Plants stress induction is the ultimate result of stress ethylene, which produced inside the plant’s tissues (Sergeeva et al. 2006; Nascimento et al. 2012). Hence, it was logical that by lowering the levels of stress ethylene with ACC deaminase-producing transgenes in genetically engineered plant’s tissues might afford some protection against the adverse effects of the environmental stress conditions (Grichko and Glick 2001b; Mayak et al. 2004; Sergeeva et al. 2006; Glick 2014). The previous findings described above paved the way for our present research work. In this study, A. thaliana plants were genetically modified for the expression of acdS gene isolated from soil bacteria Pseudomonas veronii- KJ and tested for the ability to mitigate the adverse effects of water-logging and salt stress conditions. The PCR mixture and reaction set-up were arranged for the amplification as follows. The PCR amplifications were performed in a 100 μL volume containing 1 × PCR buffer, 1.5 mM MgCl2, 0.5 μM of each primer, 10 μM of each dNTP, 0.5 U Taq DNA polymerase and bacterial cells as DNA source. The cycles of PCR were as follows: (A) 95°C for 5 minutes, (B) 95°C for 30 seconds, 50°C for 30 seconds, 72°C for 30 seconds (35 cycles), and (C) 72°C for 7 minutes. The amplified product was run on agarose gel along with marker and visualized under UV light. The amplified PCR product was sent to SOLGENT (Korea) for sequencing. The complete sequence of acdS gene of P. veronii-KJ was obtained after sequencing. The purified PCR product was cloned in to expression vector pET21a (+) for the transformation E. coli BL21 (DE3). The presence of ACC deaminase-producing gene in the recombinant clones was also confirmed by PCR amplification. The gene of interest (acdS) along with plasmids extracted from the positive clones (E. coli BL21) as template and verified. The reaction preparation, mixture and PCR conditions were similar to that explained for the acdS gene. Furthermore, appropriate amount of ampicillin was used in the Luria-Bertani (LB) culture media. 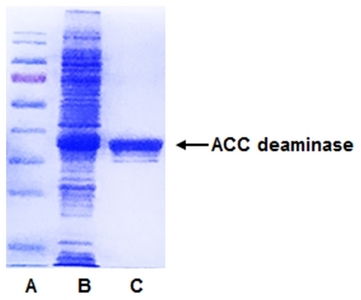 The expression of ACC deaminase in E. coli BL21 (DE3) was also evaluated through SDS-PAGE for purified ACC deaminase. The purified product was stored for 18 hours at 4°C for further study. 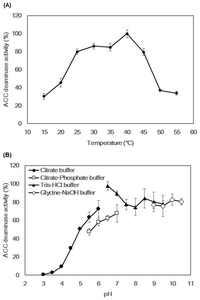 Temperature and pH for the stability and optimal activity of ACC deaminase were evaluated. The rhizobacteria P. veronii-KJ was cultured in D.F minimal medium for 20 hours at 30°C in a shaker incubator at 200 rpm and ACC deaminase activity was assayed according to the method of Penrose and Glick (2003) with slight modifications. For the evaluation of optimal temperature and pH different buffers were used such as Tris-HCl, citrate, citrate-phosphate and glycine-NaOH buffer, while a range of temperature (10 – 60°C) and pH (3 – 10.5) was applied in activity estimation. The reaction was started by adding ACC at 30°C. A 0.5 mL of 0.1 mM buffer added in the reaction and incubated for 15 minutes. To stop the reaction 1 mL of 0.56 M HCl was added to the vial and centrifuged for 5 minutes at 13000 × g. Similarly, 0.4 mL aliquot of 0.56 M HCl and 0.2% of 2, 4-dinitrophenylhydrazine in 2 M HCl were mixed with 0.5 mL of the supernatant. Which was incubated at for 30 minutes at 30°C. Two M NaOH was added in to reaction mixture for neutralization of the reaction. Finally, optical density was measured at 540 nm. A stock solution of α-ketobutyrate (Sigma Aldrich Co.) was already prepared in Tris-HCl (0.1 M, pH 8.5) and stored at 4°C were used as standard. The activities were evaluated at 30°C and pH 9. Transformation of A. thaliana was performed by the floral dip method as described by Clough and Bent (1998). The plasmid (PCB 302-3) containing acdS gene was transferred into Agrobacterium tumefaciens strain GV3101 and bacterial population was adjusted to 0.8 OD at 600 in 500 mL distilled water solution of 5% sucrose and 0.05 silwet L-77. The healthy seedlings were treated at intervals of 48 – 72 hours for four consecutive days, while the procedure was repeated for a total of four times by applying floral dip method. The seeds of mature plants were harvested and re-sowed in pots for the screening of transgenic plants. The transgenic Arabidopsis were grown in the controlled environment and transgenesis was confirmed by genomic DNA extraction, amplification and sequencing of acdS gene. A two-week-old Arabidopsis plants were used for the confirmation of successful transformation. The wild type Arabidopsis was used as a control. ACC deaminase activity was determined from the fresh plant leaf tissue (Sato et al. 1978). A three-week-old transgenic A. thaliana plant was used for the assessment ACC deaminase activity. The transgenic Arabidopsis were grouped on the basis of effective acdS gene expression. 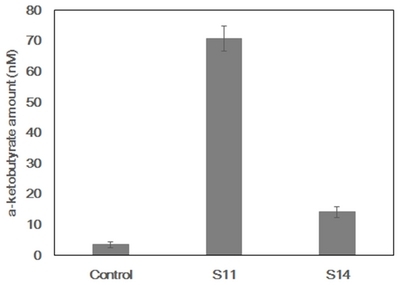 The seeds of transgenic Arabidopsis were divided into strong (S11) and weak (S14) lines and grown for the evaluation of stress and activity test. The leaf tissues of transgenic Arabidopsis were grinded in liquid nitrogen, and mixed with 100 μL of 50 mM Tris-HCl buffer (pH 7.0) per 0.048 g and subjected for the quantification of ACC deaminase. ACC deaminase activity of transformed leaf tissues evaluated by adding buffer 50 mM Tris-HCl (pH 7). For optimal activity Tris-HCl (pH 9) was used as running buffer. The seeds of transgenic Arabidopsis were surface sterilized by soaking in 70% ethanol for two minutes. To remove all epiphytic microorganisms the seeds were soaked in 10% sodium hypochlorite solution, which also containing 8% chlorine for 10 – 12 minutes. After surface sterilization the seeds were washed four times with sterile distilled water and sown onto 0.8% agar containing MS medium (Murashige and Skoog 1962). The transgenic plants were grown in a controlled environment at a temperature of 20 ± 2°C. The light intensity was kept at 250μmol/m2 /second with a 16 hour-light and 8 hour-dark photoperiods. The seedlings were treated with different concentration (0 mM, 50 mM, and 100 mM) of NaCl in the MS medium. There were 12 plant per treatment and each treatment was repeated three times. Similarly, the seeds were surface sterilized and washed with distilled water for the evaluation of water-logging stress. The surface sterilized seeds were sown in plastic pots (10.0 × 10.0 × 8.5 cm) with commercially available horticultural soil (Bio-sento-1, Hungnong-jongmyosa Company, Republic of Korea). These pots were placed in a growth chamber. The temperature and relative humidity were maintained at 20 ± 3°C and 60% respectively. While light intensity was maintained at 250 μmol/m2/second, and 16/8-hour light/dark cycle. The seedlings were grown up to three weeks in normal conditions then water-logging was applied for five days. There were three plants per treatment and each treatment was repeated three times. Both strong (S11) and weak (S14) lines were evaluated for salt and water-logging stress and compared to wild type control Arabidopsis plants. The use of specific primers and reagents in thermal cycler resulted in the appropriate amplification of acdS gene and the amplified PCR product was approximately 1,017 bp. The isolated PCR amplicon was eluted from the gel and purified. The sequence of acdS gene was obtained from the amplified and purified PCR product (Fig. 1). The entire sequence of acdS gene was 1,017 bp including the start and stop cordon. The plasmid pET21a (+) and ACC deaminase-producing gene was inserted and expressed in E. coli BL21 (DE3). Fig. 2 represents map of expression vector pET21a (+) used for cloning of acdS gene. Upon successful expression of acdS gene for the production of ACC deaminase in E. coli BL21 (DE3) the enzyme was purified on SDS PAGE (Fig. 3). For precise identification, the size marker proteins and whole cell extracts of E. coli BL21 (DE3) along with ACC deaminase were run on SDS PAGE (Fig. 3). The overexpression of ACC deaminase gene was also evaluated in E. coli BL21 (DE3). The higher amount ACC deaminase produced in E. coli BL21 (DE3) was subjected to the conversion of substrate ACC into α-ketobutyrate and ammonia. The amount of α-ketobutyrate was quantified upon catabolizing of substrate ACC (Fig. 4). In Fig. 4, the control shows the amount of α-ketobutyrate produced from E. coli BL21 (DE3) with pET21a (+) vector, while BL21/ACC deaminase demonstrates the amount of α-ketobutyrate produced from E. coli BL21 (DE3) with pET21a (+) and the expressed amount (about 1,100 nM) of ACC deaminase. In this way, the overexpression of ACC deaminase producing gene was confirmed in the transformed E. coli BL21 (DE3). Typically, the enzyme ACC deaminases are stable at temperature of 25–30°C and pH 8.0–9.0. 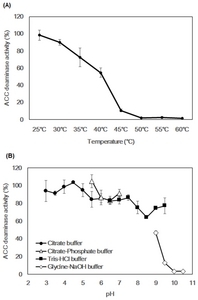 Extreme temperature and pH harshly affect the stability and optimal activity of ACC deaminase. In our results, the stability of ACC deaminase was more than 80% at 25 – 30°C, while the increase in temperature gradually affected the activity of the enzymes (Fig. 5A). It was noticed that the activity of ACC deaminase was less than 20% at 45°C, while the temperature above 50°C led to complete inactivation of the enzymes and enzymes were not stable at such high temperatures. Similarly, the activity of ACC deaminase was evaluated at varying pH, while different buffers were used for the evaluation of the enzyme activity (Fig. 5B). In citrate buffers, the activity of ACC deaminase was above 80% at pH 3 – 5, however, the activity of enzymes got decreased at higher pH (above 5). In the citrate-phosphate buffer, the enzymes were active at pH 5.6, whereas the efficiency of ACC deaminase dropped down with the increased pH (6.0 – 7.0), but was still higher compare to other buffers. Tris-HCl buffers affected ACC deaminase activity. Initially, at pH ranging 6.5 – 7.8 the activity of ACC deaminase was above 80% which was reduced at pH 8.8 and again increased at the higher pH above 9. The results for glycine-NaOH buffer were completely different from the above three buffers. The ACC deaminase activity was approximately 60% at a relatively higher pH 9, whereas the enzymes were inactive at pH 10 and above. The optimal value of temperature and pH for an enzyme depends on where it normally reacts on the substrate. The rate of reaction got increased with increase in temperature, but very high temperatures inactivate or denature the enzymes (Fig. 6A). The Fig. 6A demonstrates the change in ACC deaminase activity with increasing temperature. The activity of the enzyme gradually increases with the increase in temperature. The enzymes showed more than 80% activity from 25 – 35°C, however, the optimal activity of the enzyme was revealed at 40°C. Subsequently, the activity of ACC deaminase got decreased at higher temperature as enzyme denaturing starts above 40°C. Several studies reported that changes in pH alter the conformation of enzymes. Different enzymes work best at their optimal pH values. In this study, we used a range of pH (3 – 10.5) for the evaluation of optimal activity conditions for the purified ACC deaminase. Similarly, we used four different buffers for the maintenance of appropriate pH conditions. In the citrate buffer, optimal activity of ACC deaminase was approximately 75% at pH 6. However, at lower pH in same buffer, the activity of the enzyme was low. Similarly, in the citrate-phosphate buffer, the optimal activity (70%) was revealed at pH 7. The optimal activity of ACC deaminase in Tris-HCl based buffers was around 99% at pH 6.8, whereas, low (78%) at higher pH 8. Furthermore, the optimal activity of pure ACC deaminase in glycine-NaOH buffer was about 80% at pH 9 to pH 10.5 (Fig. 6B). RT-PCR analysis of three-week-old wild type and transgenic plant showed that acdS gene was up-regulated by over-expression of bacterial acdS gene in transgenic plant (Fig. 7). Leaf tissues of wild type and transgenic Arabidopsis were used for the extraction of mRNA. Furthermore, ACC deaminase activity in a three-week-old transgenic Arabidopsis was confirmed by the enzyme activity assays and compared to wild type plants. 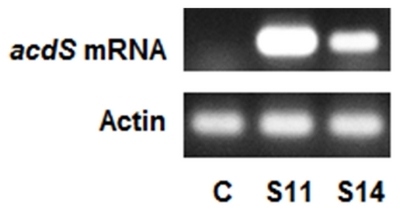 In this study, the highest level of ACC deaminase activity was observed in leaves of strong expression line S11 about 70 nM followed by the weak expression line S14 20 nM (Fig. 8). 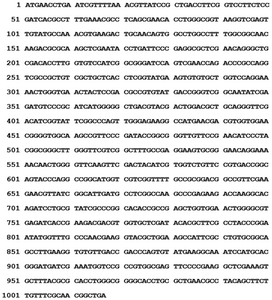 This result indicates that the expression of acdS gene encodes for ACC deaminase in the leaves tissues of transgenic Arabidopsis plant. Transgenic and wild type Arabidopsis seedlings were grown in the presence of different salt concentration (0 mM, 50 mM, and 100 mM) in the MS medium. The growth and development of wild type Arabidopsis seedlings were adversely affected by increased salt concentration and revealed retarded growth at 100 mM. Transgenic line S11 of Arabidopsis seedlings showed a high level of tolerance to salt stresses followed by weak transgenic line S14 (Figs. 9 and 10). Our result confirmed that the expression of acdS gene in transgenic seedlings enhance tolerance to the adverse effect of salt stress compared to control plants. However, it was also observed that at 0 mM concentration of NaCl, transgenic and control seedlings demonstrated similar performance. Whereas, increase in the salt concentration inhibits the normal growth and development of control seedlings compared to transgenic Arabidopsis, which tolerate the adverse effect of high salt stress. The damages to Arabidopsis from high levels of water-logging and salt stress takes place as a consequence of stress ethylene that is synthesized in plant tissues in response to stress condition. As five consecutive days of water-logging paved the way for the production stress ethylene in both control and transgenic plants which adversely affected the control plants compared to transgenic Arabidopsis strong line (S11) followed by weak line (S14). Similarly, ACC deaminase transgenic Arabidopsis seedlings (S11) appeared healthier and greener compared to control plants. Our results showed that the expression of acdS gene in transgenic Arabidopsis strong line (S11) significantly alleviates the adverse effects of water-logging stress. Plants encode for the increased amount of ACC synthase in response to a variety of stress conditions. The higher concentration of ACC synthase produces the greater amount of ACC, which is the immediate precursor of ethylene inside plant tissues (Glick 2014). The loss of plant growth and development from water-logging, high salt concentration as well as other abiotic stresses occurs as consequences of stress ethylene (Grichko and Glick 2001b; Glick 2005; Vanderstraeten and Vander Der Straeten 2017). Recently, several researchers have paved their attention for the alleviation of stress ethylene inside plants tissues and appropriate the yield of the plants. In this context, the researchers suggested two different methodologies for the alleviation of stress ethylene and its harmful effects on plants: genetic modification of the plants, inoculum development for ACC deaminase production (Klee et al. 1991; Jacobson et al. 1994, Glick et al. 1998; Stearns and Glick 2003; Vanderstraeten and Vander Der Straeten 2017; Nascimento et al. 2018). A number of different studies have demonstrated the use of ACC deaminase-producing bacteria as inoculum in different stress conditions such as flooding (Grichko and Glick 2001a; Glick et al. 2007), heavy metals (Burd et al. 1998) and high salt concentration (Mayak et al. 2004) with significant results. Additionally, the development of genetically modified plants with acdS transgene of ACC deaminase-producing bacteria lowers the levels of ACC and stress ethylene compared to non-transgenic plants under flooding, heavy metals, pathogenic infections and salt stress conditions (Grichko et al. 2000; Grichko and Glick 2001b; Robison et al. 2001; Sergeeva et al. 2006; Zhang et al. 2015). The isolation, sequencing and cloning of acdS gene of P. veronii-KJ into E. coli BL21 (DE3) have successfully transformed model plant A. thaliana. When transgenic and control A. thaliana were subjected to different salt concentrations (0 mM, 50 mM, and 100 mM), the growth and development of the seedlings decreased with the increase of salt concentration in the MS media. The transgenic strong line (S11) showed better results than transgenic weak line (S14), and both of the transgenic lines were significantly healthier compared to wild type plants (Fig. 9). Similarly, Sergeeva et al. (2006) genetically modified canola plants for the expression of bacterial ACC deaminase gene and evaluated on different concentrations of salt (0 mM to 200 mM). Their results also revealed that the expression of acdS gene significantly mitigates the adverse effect of salt stress on six weeks old canola plants and yields significantly more root and shoot biomass compared to wild type canola plants (Sergeeva et al. 2006). In plant roots, the increased amount of ACC is produced under hypoxic condition in response to flooding. The increased amount of ACC is not oxidized by ACC oxidase in oxygen deficient environment and is transported to shoot for oxidation and conversion into ethylene. In hypoxia, as ACC oxidase exhibits a higher affinity for substrate ACC than ACC deaminase, the conversion of ACC to α-ketobutyrate and ammonia is favored over its oxidation to ethylene (Glick 2014). In this manner, transgenic Arabidopsis expressing bacterial ACC deaminase were more resistant to water-logging stress compared to control plants (Fig. 11). Initially, both the transgenic and nontransferred Arabidopsis were critically affected by water-logging stress and a slight difference was noticed on the fifth day of flooding, but after removal of excessive water transgenic Arabidopsis significantly recovered into its normal state compare to control plants. This negative effect on the commencement of water-logging may be due to the constitutive expression of 35S promoter, which highly upregulates metabolic activities of the plants. A similar observation was concluded by Grichko and Glick (2001a) for transgenic tomato plants, expressing the bacterial enzyme ACC deaminase under the constitutive expression of 35S promoter. They also reported that transgenic tomato plants that express ACC deaminase constitutively under 35S promoter were less efficient than the plants with rolD root specific promoter (Grichko and Glick 2001a). Finally, our study suggesting that the transformation and expression of bacterial transgene in the model plant (A. thaliana) for the production of ACC deaminase under salt and water-logging stress conditions will definitely contribute to the successful development and expansion of transgenic crop plant varieties for saline and water-logged regions of the world. This work was carried out with the support of “Cooperative Research Program for Agriculture Science & Technology Development (Project No. PJ012286042018)” Rural Development Administration, Republic of Korea. Fig. 1. Nucleotide sequence of ACC deaminase (acdS) gene. Fig. 2. The map of expression vector pET21a (+) used for cloning of acdS gene. Fig. 3. SDS PAGE analysis of the purified ACC deaminase. A, protein marker; B, crude extract of transformed E. coli; C, purified ACC deaminase. Fig. 4. Expression of ACC deaminase in E. coli BL21 (DE3). Control represents E. coli BL21 (DE3) with empty pET21a (+) vector, while BL21/ACC deaminase show E. coli BL21 (DE3) with pET21a (+) harboring ACC deaminase gene. Fig. 5. Demonstration of the stability of ACC deaminase. (A) temperature stability and (B) pH stability. Fig. 6. 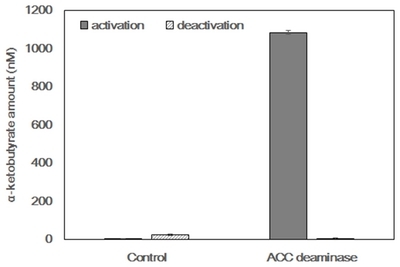 Demonstration of the optimal activity condition of the purified ACC deaminase. (A) optimal temperature and (B) optimal pH. Fig. 7. Expression of the ACC deaminase gene in A. thaliana leaf tissue. C, wild type; S11, strong expression line; S14, weak expression line. Fig. 8. Demonstration of the ACC deaminase activity level in the leaf tissues of transgenic A. thaliana. Fig. 9. Demonstration of salt stress effect on transgenic and wild type Arabidopsis seedlings on the 25 days in MS-media. A, effect of 0 mM NaCl; B, effect of 50 mM NaCl; C, 100 mM NaCl on control, strong line S11 and weak line S14. Fig. 10. Root length of transgenic and wild type Arabidopsis seedlings on salt stress condition during the seven days in MS-media. A, 0 mM NaCl; B, 50 mM NaCl; C, 100 mM NaCl on control, strong line S11 and weak line S14. Fig. 11. Effect of ACC deaminase gene on water-logging stress. Water-logging stress was applied for five days. Control, wild type; S11, strong expression line; S14, week expression line. Barnawal, D, Bharti, N, Maji, D, Chanotiya, CS, and Kalra, A (2014). ACC deaminase-containing Arthrobacter protophormiae induces NaCl stress tolerance through reduced ACC oxidase activity and ethylene production resulting in improved nodulation and mycorrhization in Pisum sativum. J Plant Physiol. 171, 884-894. Blaha, D, Prigent-Combaret, C, Mirza, MS, and Moënne-Loccoz, Y (2006). 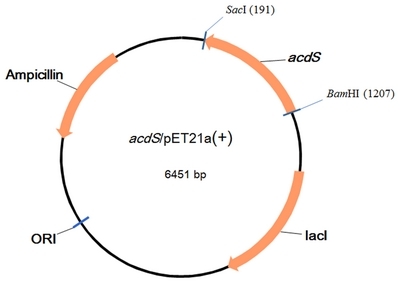 Phylogeny of the 1-aminocyclopropane-1-carboxylic acid deaminase-encoding gene acdS in phytobeneficial and pathogenic Proteobacteria and relation with strain biogeography. FEMS Microbiol Ecol. 56, 455-470. Burd, GI, Dixon, DG, and Glick, BR (1998). 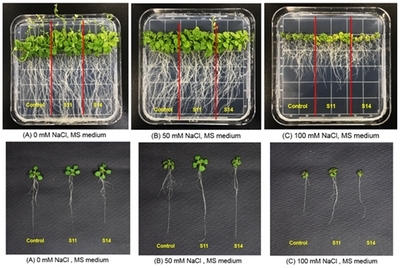 A plant growth-promoting bacterium that decreases nickel toxicity in seedlings. Appl Environ Microbiol. 64, 3663-3668. Clough, SJ, and Bent, AF (1998). Floral dip: a simplified method for Agrobacterium-mediated transformation of Arabidopsis thaliana. Plant J. 16, 735-743. Glick, BR, Cheng, Z, Czarny, J, and Duan, J (2007). Promotion of plant growth by ACC deaminase-producing soil bacteria. Eur J Plant Pathol. 119, 329-339. Glick, BR, Penrose, DM, and Li, J (1998). A model for the lowering of plant ethylene concentrations by plant growth-promoting bacteria. J Theor Biol. 190, 63-68. Glick, BR (2005). Modulation of plant ethylene levels by the bacterial enzyme ACC deaminase. FEMS Microbiol Lett. 251, 1-7. Glick, BR (2014). Bacteria with ACC deaminase can promote plant growth and help to feed the world. Microbiol Res. 169, 30-39. Grichko, VP, Filby, B, and Glick, BR (2000). Increased ability of transgenic plants expressing the bacterial enzyme ACC deaminase to accumulate Cd, Co, Cu, Ni, Pb, and Zn. J Biotechnol. 81, 45-53. Grichko, VP, and Glick, BR (2001a). Amelioration of flooding stress by ACC deaminase-containing plant growth-promoting bacteria. Plant Physiol Biochem. 39, 11-17. Grichko, VP, and Glick, BR (2001b). Flooding tolerance of transgenic tomato plants expressing the bacterial enzyme ACC deaminase controlled by the 35S, rolD, PRB-1b promoter. Plant Physiol Biochem. 39, 19-25. Jacobson, CB, Pasternak, JJ, and Glick, BR (1994). Partial purification and characterization of 1-aminocyclopropane-1-carboxylate deaminase from the plant growth promoting rhizobacterium Pseudomonas putida GR12-2. Can J Microbiol. 40, 1019-1025. Klee, HJ, Hayford, MB, Kretzmer, KA, Barry, GF, and Kishore, GM (1991). Control of ethylene synthesis by expression of a bacterial enzyme in transgenic tomato plants. Plant Cell. 3, 1187-1193. Lund, ST, Stall, RE, and Klee, HJ (1998). Ethylene regulates the susceptible response to pathogen infection in tomato. Plant Cell. 10, 371-382. Mayak, S, Tirosh, T, and Glick, BR (2004). Plant growth-promoting bacteria confer resistance in tomato plants to salt stress. Plant Physiol Biochem. 42, 565-572. Morgan, PW, and Drew, MC (1997). Ethylene and plant responses to stress. Physiol Plant. 100, 620-630. Murashige, T, and Skoog, F (1962). A revised medium for rapid growth and bio assays with tobacco tissue cultures. Physiol Plant. 15, 473-497. Nascimento, F, Brígido, C, Alho, L, Glick, BR, and Oliveira, S (2012). Enhanced chickpea growth-promotion ability of a Mesorhizobium strain expressing an exogenous ACC deaminase gene. Plant Soil. 353, 221-230. Nascimento, FX, Rossi, MJ, and Glick, BR (2018). Ethylene and 1-aminocyclopropane-1-carboxylate (ACC) in plant-bacterial interactions. Front Plant Sci. 9, 114. Peng, HP, Lin, TY, Wang, NN, and Shih, MC (2005). Differential expression of genes encoding 1-aminocyclopropane-1-carboxylate synthase in Arabidopsis during hypoxia. Plant Mol Biol. 58, 15-25. Penrose, DM, and Glick, BR (2003). Methods for isolating and characterizing ACC deaminase–containing plant growth–promoting rhizobacteria. Physiol Plant. 118, 10-15. Robison, MM, Shah, S, Tamot, B, Pauls, KP, Moffatt, BA, and Glick, BR (2001). Reduced symptoms of Verticillium wilt in transgenic tomato expressing a bacterial ACC deaminase. Mol Plant Pathology. 2, 135-145. Sato, S, Honma, M, and Shimomura, T (1978). The conversion of α-aminoisobutyrate decomposing enzyme into simple L-alanine: α-ketobutyrate aminotransferase by chemical modification. Agric Biol Chem. 42, 2341-2346. Sergeeva, E, Shah, S, and Glick, BR (2006). Growth of transgenic canola (Brassica napus cv. Westar) expressing a bacterial 1-aminocyclopropane-1-carboxylate (ACC) deaminase gene on high concentrations of salt. World J Microbiol Biotechnol. 22, 277-282. Singh, RP, Shelke, GM, Kumar, A, and Jha, PN (2015). Biochemistry and genetics of ACC deaminase: a weapon to “stress ethylene” produced in plants. Front Microbiol. 6, 937. Stearns, JC, and Glick, BR (2003). Transgenic plants with altered ethylene biosynthesis or perception. Biotechnol Adv. 21, 193-210. Vanderstraeten, L, and Van Der Straeten, D (2017). Accumulation and transport of 1-aminocyclopropane-1-carboxylic acid (ACC) in plants: current status, considerations for future research and agronomic applications. Front Plant Sci. 8, 38. Zhang, F, Zhang, J, Chen, L, Shi, X, Lui, Z, and Li, C (2015). Heterologous expression of ACC deaminase from Trichoderma asperellum improves the growth performance of Arabidopsis thaliana under normal and salt stress conditions. Plant Physiol Biochem. 94, 41-47.